I have another great product to feature from Learning Resources this month! (see my previous review here and here). Learning Resources is a leading manufacturer of innovative, hands-on educational materials for classrooms and learning toys for the home. For more than 25 years, the company has been a trusted source for educators and parents for quality, award-winning educational products. I generously received a new product from Learning Resources 2012 New Products: the New Sprouts™ Serve it! My Very Own Dish Set. This set is an oh-so-dishlicious set for toddlers! It is suitable for Ages 2-7. My son just got a new kitchen set for Christmas but it didn't come with any dishes! 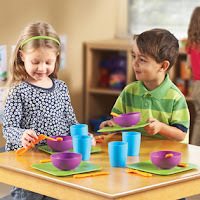 He absolutely LOVES to play pretend cooking and serving so I knew he would LOVE this dish set from Learning Resources! And I was right! He immediately started serving me "drinks" in the cups and food on the plates and in the bowls. "I made you a shake, Mommy!" "Here, eat this food - it's delicious!" These are common phrases I hear every day now that he has this super fun dish set. They are easy to hold, colorful and fun, and great for pretending! Best of all, they are dishwasher safe so they can be washed when the pretending gets a little out of hand! I recommend the Sprouts Serve It! Dish Set for all children that love to play house and pretend cooking and serving! It is priceless to see how much fun my son has pretending and serving me his food and I am sure your children will have just as much fun and create some priceless memories with this dish set! Buy It: You can purchase the Sprouts Serve It! 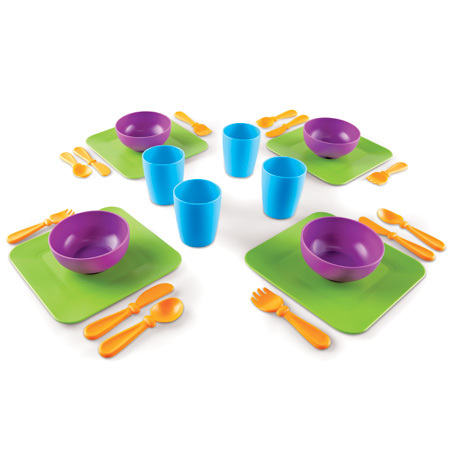 Dish Set for $24.99 on the Learning Resources website. Win It: Learning Resources is generously offering (1) Serve it! My Very Own Dish Set to a lucky winner! Hello! I am sorry, but I made a mistake while filling out the form--in the second spot, I accidentally gave my Google + name instead of my email address.